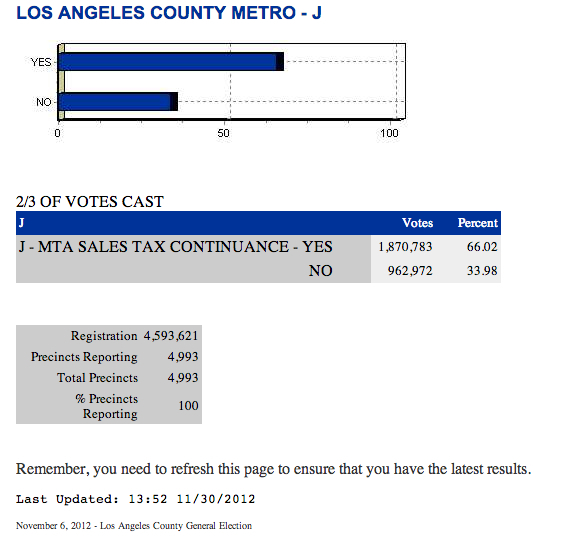 Here are the latest Measure J results, posted online by the Los Angeles Country Registrar a few minutes ago. The percentage of ‘yes’ votes for Measure J jumped from 65.88 percent after the last update on Wednesday to 66.02 percent today. It’s still extremely unlikely that Measure J will muster the number of votes to pass. But it’s certainly fascinating to watch how close J came to the two thirds (66.67 percent) it needed to be approved. In terms of raw votes, it looks like Measure J is about 16,500 votes shy of passage. The Registrar told Metro that it was planning on counting about 50,000 votes today and the final 25,000 on Sunday. So the final ‘yes’ votes may go up again. As for the issue of turnout, a total of 3,001,783 votes were cast in the Measure R election in Nov. 2008 when Barack Obama was first running for president. It looks like roughly 2,858,755 will have cast ballots for Measure J this time around — in other words, about 143,000 fewer. Was that a factor in J’s defeat? I think so — I believe many people who came out to vote for Obama in 2008 were also likely to vote for expanding Los Angeles County’s transit system. Overall, statistics from the Registrar show a turnout of 69.69 percent for this past election compared to 81.92 percent in Nov. 2008. Another interesting twist: a similar sales tax extension in Alameda County to help fund transit failed with 66.53 percent of the vote. The Alameda County Transportation Commission has asked for a recount, hoping to recover the 400 votes needed for passage. For all intents and purposes, two-thirds of voters in Los Angeles and Alameda counties voted for these measures. You get into semantics once you start splitting decimal points. To have the transportation policy decided by the overwhelming minority of voters is disappointing and needs to change. Agreed… especially since the rhetoric around most of the country is calling a slightly over 50% majority a “mandate.” This is far-and-away a more favorable vote than most. If Metro didn’t try to cheapskate the Azusa-Claremont extension, Measure J would have most definitely passed by now. Two-thirds vote is 66.666666… 66.02 is not close enough. Besides, we still have about 27 years on Measure R. Why on earth do we need to vote to extend the tax now? That just seems silly – who knows what kind of world we’ll be living in then? (Okay, we probably won’t be jetting around in spaceships a la The Jetsons, but still). Alameda County’s Measure B1 was not only a tax extension in perpetuity (i.e. changing a “temporary” tax into a permanent one), it also would have doubled the existing transactions and use tax (meaning it was a tax increase as well). The proponents’ website [yesonb1.com] went out its way to bury this. Measure B1 was far more pernicious than Measure J, but it might well have passed if Proposition 30 wasn’t also on the same ballot. The Feds will be around in two years. Metro can try again. Add the funding for the Azusa-Claremont Gold Line extension, some money to extend the blue line to Long Beach Airport and $$ for the Orange or Red line to the Burbank Airport that should get a few more thousand votes. The Red Line to Burbank Airport would be really cool. Rather than relying upon massive and long-term debt to build and get things done, how about we develop surpluses from which to fund our projects and needs.? The Debt mentality gets old. 2069? Simply silly! Sure the funding at 2% long-term makes some decent sense… but 2069 folks? Debt is not practical any longer. Surpluses are. Cut salaries at the top first and widespread, get truly competitive bidding and project costs, be efficient, plan for efficiency, and get surpluses. By extending the tax now, we can push up the timelines of the big projects that Measure R would have drag on into the 2020s/2030s. The sooner the better as Metro has already begun work on projects like the Downtown Connector, Westside Subway, and there are various projects like the LAX connector, and Sepulveda Pass Project that could use the boost. However this doesn’t mean the Measure can’t be put on the ballot again. 2014 or 2016 come to mind, but usually presidential elections pull out higher turnout that favor these transportation measures. Surely we need to commit to bringing it back. On the 2/3rds I think a lot more people are coming to realize the ridiculous nature of the 2/3rd requirement for tax measures. Clearly the Measure has a blessing of most of the county, even in areas that the projects don’t directly connect too had a good amount voting 50% yes. 2/3rds is just simply not good for counties that are starved for funds for these projects, and I hope the state addresses this issue or at least puts it onto the ballot to have people reconsider the requirement. Amending the state constitution to get rid of this onerous requirement once on the ballot only requires a simple majority. Cassie — The extension was to guarantee revenue from future tax increases, which would have allowed the Measure R projects to be fully-funded and expedited through bond sales instead of constructed 30 years from now. That’s why Measure J was and continues to be a good idea; to speed up these vital projects and fill gaps in funding for them. I can hazard a guess at the kind of world we’ll be living in in 30 years — one with skyrocketing fuel prices. Rejecting Measure J (assuming it falls just short of the required supermajority) was penny-wise, pound-foolish. cassie, I wish I was as ignorant as you. I hope you never complain about traffic or air quality as you and 34% of Measures J voters just lost that right. If the total number of votes on Measure J is 2,858,755 then 66.67% of that is 1,905,932. If there are 75,000 more votes to count, then 1,905,932 minus 1,870,783 leaves 35,149 which is only 35,149/75,000 = 48.9% of the remaining votes. If these numbers are correct I would think that Measure J will pass. Is the the “bullet train” (a.k.a. high speed rail) the elephant in the room? It’s a big waste of money that gives a bad name to the rest of rapid transit in California.